Alans!! That picture (and the article) have just kick started an avalanche of memories,though I suspect I'm older than the author,as I can remember Alans starting up as a stall on wigan market before moving into that beloved shop,and before he started selling skate/bmx gear-just vinyl and comics. Reading batman and listening to early voivod,sheer joy! 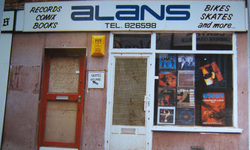 Didnt Alan also start his own local record label? Clearly remember watching a few napalm death-type bands in that tiny shop (you can only imagine the volume),and being told they were "his bands". Just curious, any info would be good-top article!